Part of the qualifying/timebuilding for a Commercial PIlot’s License is a long cross-country trip, at least 300NM from your point of orgin. Most people make a flying expedition out of it, taking a couple of days and sometimes a friend – there’s no round-trip requirements, so two people can share a 300NM trip – one person flies out, the other back, both get their trip done. That’s exactly what two friends have done over the last three days, and they invited me along (I completed mine several years ago) because I’ve been into the United States by air and they hadn’t before this. We went from Victoria, BC, Canada down to North Bend, Oregon via Seattle-Boeing Field & Astoria, then turned inland and north back to McMinnville, Oregon, home of the Evergreen Aviation Museum & the Spruce Goose. Wikipedia has a good Hughes H4 (Spruce Goose) article, for those wanting more information. Short version: It’s a monster airplane, the biggest thing in the world at the time, still the largest seaplane & largest wooden aircraft ever made; only the 747 & A380 really rival it in sheer size. The main building of the Evergeen Museum is a huge building, and it’s still barely large enough to fit the H4 in. There’s absolutely no way to take a picture of the entire beast; the building would have to be three times the floorspace to allow you to get far enough back and still be inside! My camera does reasonable wide-angle setups, but you either need a fisheye lens or you need to resort to panorama stitching to get the whole beast in. Lacking a fisheye, I turned to Hugin, which has the additional advantage of being both free and Free. 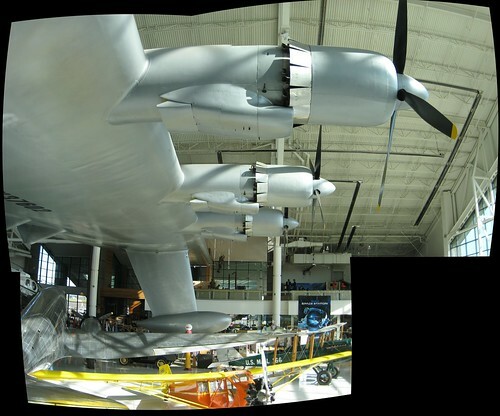 More over the next few days, as I sort & process almost 200 photos, almost all from the Spruce Goose’s museum!